Become a reseller and resell our products under your brand name. 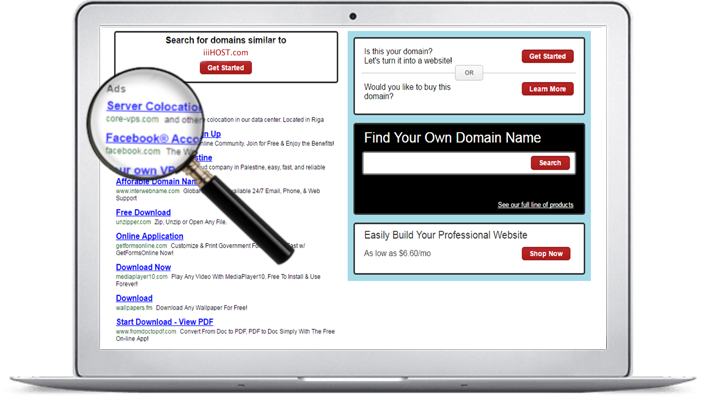 We provides everything you need to sell domains, hosting, email, website building tools and SSL certificates. The program includes white-labeled products, a professional storefront and the freedom to set your own prices. We even process payments, so you don’t need your own merchant account. Create account to become a Reseller & get FREE extras up to $505* value bonus products. Our reseller plans have pre-built and customizable eCommerce storefronts with your name baked right in. You'll even get your name on nearly all our products. 14000+ Customers are already building amazing reseller business with us. Get started in under 5 minutes & become your own boss with reseller business. Everything you can as your choice set your prices and decide your profits and sell domains hosting email SSL certificate website builder and more right from your own storefront. Let’s talk about money, Lots of it. While other reseller programs may talk about commission rates ours stands out from the crowd. Here you can set your own margins. That’s right you pick and choose how much money you make off each product. It feels good to have that power right? Wholesale pricing up to 40% off retail. Choose custom colors for borders, titles, text and links. Preview each change every step of the way. White-label ecommerce credit card processing included. Set up your brand storefront instantly. Domain CashParking® "PPC" 80% revenue share. No need any technical knowledge and skills. No limits - sell all products to unlimited customers. You care only about promoting your brand worldwide. We stay completely invisible. Your customers will have no idea we're even involved. Only name your customers see is yours brand. We provide FREE 24/7 support for you and your customers. Here are just some of the FREE extras (up to a $505* value) you get when you sign up to become a Reseller! Build your storefront site in minutes using our exclusive Design Wizard. Customize text, graphics and links. Cart and payment processing built in! Be ready for business with 150 GB storage, unlimited bandwidth, access to dozens of free software apps and much more. Plus, feel confident with 99.9% network uptime and expert 24/7 support. A secure certificate is a proven way to reassure your customers that any transaction with your site is 256-bit encrypted and secure. Keep in contact with your customers the spam-free and legal way. We provide the templates and help you generate the mailing lists. Easily prepare, analyze, optimize and submit your Web pages to Google, Yahoo!, MSN and other key search engines and directories. Our InstantPage site builder – fast and easy way to create an eye-catching unlimited page website. Just personalize one of our stunning themes with your text, background and more and you’re ready to go live on the Web in minutes! When you need on-the-go access to any file, Online Storage gives you access to all your important files and even lets you synchronize files on your computer. Create a unique and professional email address based on your domain names and promote your company with every message. Why wait? Get all this and more when you sign up to become a iiiHOST.com Reseller! Choose the plan that’s right for YOU! and start your EARNING today. Competitive Buy Rates! Sell over 40+ products. Standard buy rates, up to 20% off retail. Credit card processing and more. No deposits, advances or revenue sharing. You set your prices. You decide your profits. Features a pre-built, fully customizable website hosted in our world-class data center. We handle billing and customer support – you just sit back and wait for your commission check! Your site is live from the moment you sign up. FREE! bonus software to help you sell! Standard buy rates, up to 40% off retail. Make money from your customers domains’ parked pages! CashParking is an online domain monetization system* that quickly and easily lets you earn Pay-Per-Click commission on customers' parked domains. Each time someone clicks on advertising that you'll get 80% generates revenue on customers domain parked pages CashParking Pay-Per-Click offers the most competitive revenue sharing in the industry and is backed by the world-class customer support you've come to expect from iiiHOST. Being able to set my own margins and sale prices allows me to truly run my own business. iiiHOST Reseller Programs offers some serious goodies and great customer support. This has been a great addition! My clients get top-of-the-line products and 24/7 support. I get ongoing commissions when they renew their services with my reseller programs. These are some of the most common questions and answers about our reseller programs. What is the Reseller Partner Program? Our Reseller Programs consists of two levels: Registered and Certified that provide the products and tools you need to run a profitable business. 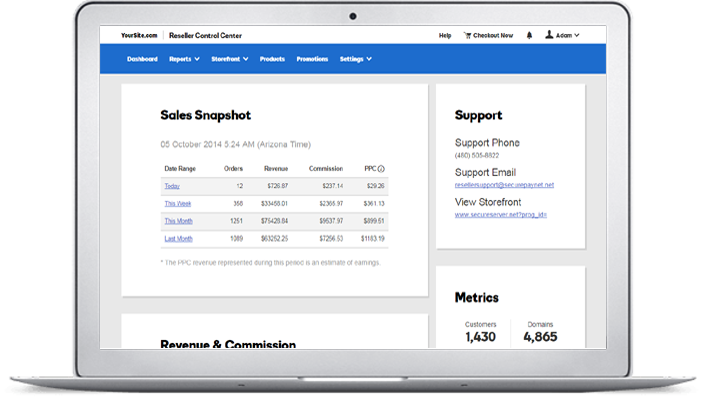 Our robust Reseller Control Center lets you manage your storefront, account settings and customers; run reports to track sales and commissions; beef up your marketing efforts; and more! *Market to international customers – our reseller plans let you offer multiple currency options and ccTLD choices. What else do I get with a reseller plan? Your reseller programs includes the following extras up to a $505* value products : Free software including *Reseller Web site *Search Engine Visibility *Online profit and activity reporting *Express Email Marketing® *Online Storage *Website Builder *Reseller Handbook *24/7 Support for you and your customers *Web Hosting *Marketing promotions to drive your profits even higher! *SSL Certificate to use for your business. Who determines the pricing on my reseller storefront? You do. You can set the pricing for products and services individually, offer special sales and promotions, even provide certain customers with discount pricing. We also have a global pricing option that lets you quickly set the pricing for all of your products at once. We offer a wide variety of payout options for your commissions (PayPal, EFT, Check). We usually pay the commission you earn during one month at the end of the following month. For example, if you earned commission on your reseller hosting sales during January, we’ll pay you at the end of February. What does it mean to be a white-label reseller? When you sell white-label products or services, the name of the company that produces those services is replaced with your company name. So whether you want to be a white label email reseller or a white label hosting reseller or both, the only name your customers will ever see is yours. Can I customize my storefront? Yes. You can use our Storefront Designer to make your storefront reflect your personal brand. We give you control over your site’s domain name, site logo, color scheme, page layout and more. You can always go back and make changes as your business grows. Who will provide customer service to my customers? We have a dedicated team to support your customers 24/7, by phone or email. Our award-winning team will represent your brand and take your customer service to the next level. They also sell products on your behalf. We are so confident that you will enjoy the ease and flexibility of our reseller programs that we are backing them with a 30-DAY MONEY BACK GUARANTEE. Take advantage of these RISK-FREE money making opportunities NOW! If you want to cancel your reseller account for any reason, within 30 days of the date you purchased the reseller program, you are entitled to a full refund of the sign-up fee. If you receive a full refund for our Basic Reseller or Pro Reseller programs, you will not receive commissions on the purchases made at your reseller stores. All customers who made a purchase at your reseller stores will be transferred to a different reseller to manage their products. We’re here to help 24/7. Our award-winning support team can help you get up and going, address any technical concerns, even provide tips and tricks on how to become a reseller. It’s all included free with your plan. Copyright © 1999 – 2018 iiiHOST.com All Rights Reserved.